A weekend that started out with two sick children and a stressed out dad did not promise to be anything but bad news. However, the extra day helped! Everyone was sleeping a lot more than normal, and while it was sad to see the little ones a little out of steam, I savored the joys of sleeping in. I am the quintessential late night person, who can stay up till all hours and then sleep in. I do not enjoy afternoon naps, but love to wake up late and then enjoy cooking and savoring breakfast with the family. One of our favorite breakfasts is an Indian version of scrambled eggs, that is popularly called masala scramble. Now, while I do give you a recipe here, this is one of those home style creations that everyone does a little differently. I through in a generous helping of seasonal vegetables, spinach or mushrooms and if you want to truly be indulgent you can add in some diced potatoes as well. 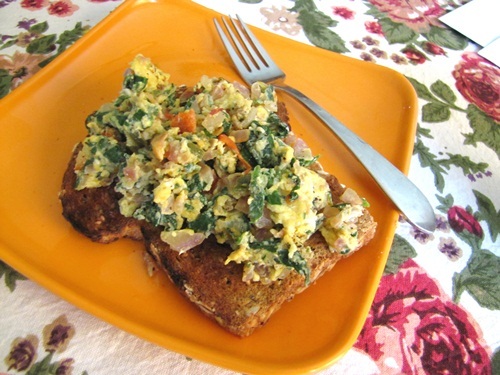 Masala scramble is best enjoyed on crisp toast. I have switched to dry toast but most people will tell you that this is best on crisp whole grain toast nicely buttered and a good cup of strong tea. A dose of this will cheer you up and get you on the way to enjoying the rest of the week. 1. Heat the oil on medium heat on a skillet. 2. Add in the cumin seeds and wait till they begin to sizzle and add the red onion. 3. Sauté the onion for about 3 minutes, until soft and translucent. 4. Add in the tomatoes and green chilies cook for 5 minutes on medium heat, the tomatoes should be somewhat try and well mixed with the onions. 5. Add in the spinach and cook till wilted. 6. In the meantime, beat the eggs with the salt and cilantro. 7. Lower the heat and pour the eggs over the spice base. 8. Gently scramble the eggs until mixed. This should be done frequently but not continuously to allow the formation of firm streaked curds of softly cooked eggs. 9. Mix in with the pepper. 10. Serve alone or over toasted bread. So what on your calendar as you get ready for Fall?